Chenanisuchus ("Chenane crocodile") is a genus of dyrosaurid crocodyliform from the Late Cretaceous of Mali and the Late Palaeocene of Sidi Chenane in Morocco. It was described in 2005, after expeditions uncovered it in 2000. The type species is C. lateroculi ("lateralis", lateral; "oculi", eyes), in reference to the laterally facing eyes. Currently, Chenanisuchus is the most basal known dyrosaurid. Two specimens of C. lateroculi – OCP DEK-GE 262 (holotype, nearly complete skull with mandibular fragments) and OCP DEK-GE 61 (nearly complete skull) – come from the Sidi Chenane area in Morocco, which is Late Palaeocene (Thanetian) in age. Fossils of Chenanisuchus were also found in Maastrichtian age strata in Mali, what shows that Chenanisuchus survived the Cretaceous–Paleogene extinction event. Chenanisuchus lateroculi has an estimated adult length between 4 and 4.5 meters, based on the 60 centimeter long skull. 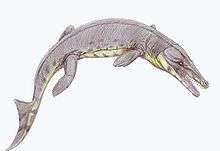 It has the shortest snout relative to the dorsal skull length among all dyrosaurids. ↑ Jouve et al., 2005. ↑ Hill, Robert V.; McCartney, Jacob A.; Roberts, Eric; Bouaré, Mohamed; Sissoko, Famory; O'Leary, Maureen A. (2008). "Dyrosaurid (Crocodyliformes: Mesoeucrocodylia) Fossils from the Upper Cretaceous and Paleogene of Mali: Implications for Phylogeny and Survivorship across the K/T Boundary". American Museum Novitates. 3631: 1–19. doi:10.1206/598.1.